From the where did she go department... The Pharcyde @ the Mohawk on Saturday, Jan 22nd! The Pharcyde (pronounced /ˈfɑrsaɪd/) is an alternative hip hop group from South Central Los Angeles, where the group's members grew up. The original four members of the group are Imani (Emandu Wilcox), Slimkid3 (Trevant Hardson), Bootie Brown (Romye Robinson) and Fatlip (Derrick Stewart). DJ Mark Luv was the group's first DJ, followed by producer J-Swift and then J Dilla. The group is best known for the hit singles "Drop", "Passin' Me By" and "Runnin'", as well as their first album, Bizarre Ride II the Pharcyde. 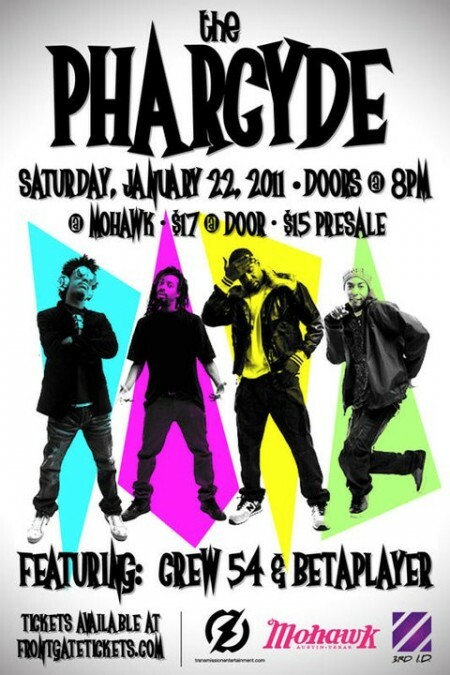 Pharcyde group members Slimkid3, Bootie Brown, and Imani met as dancers in the late 1980s and dancing was their main ambition as late as 1990. Around this time, Imani and Slimkid3 were in a group called "As Is" and later a group called the "Play Brothers", whilst Bootie Brown was a backup dancer for Fatlip (Fatlip being the last member to join the group). Bootie Brown recalls that their earlier dancing careers influenced their rapping - "sometimes the way I rap is almost like the way I used to dance". The group met Reggie Andrews, a local high-school music teacher who worked with the Dazz Band and Rick James, and who was a major musical influence on their debut album. The group also met producer J-Swift around this time, as he was Reggie Andrews's "star pupil" according to the book Check the Technique.